Wish I could help. Wish I knew. 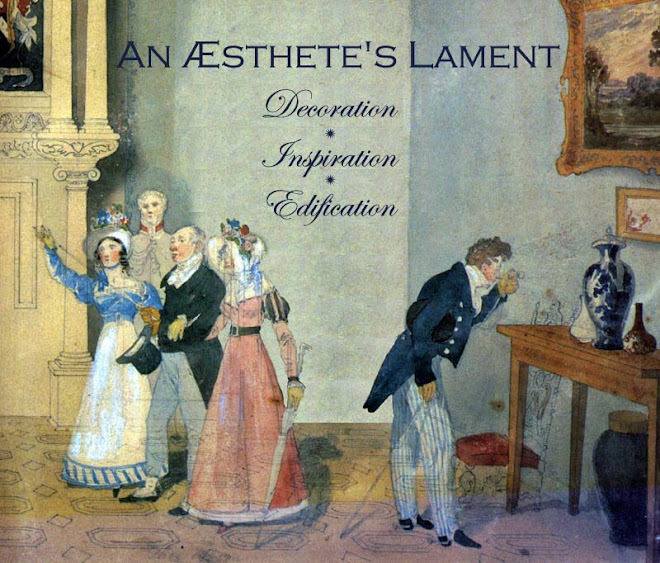 If this is purely academic, might I suggest you ask at Edmond Petit as it looks like their work (and not a million miles off that stripe used in that bedroom with the Chinese wallpaper). On the practical side, if a small quantity is needed I'm sure Gainsborough could accommodate. Marvic could be another place worth consulting as they have an extensive archive and still do moires produced in France. Look forward to your solving this mystery-No doubt You will, however-I can not imagine that anyone should know-but you. The fabric is wonderful and romantic, but at work I shop for fabrics everyday and I've never seen anything like it. Try Claremont at 62nd and 3rd Avenue, they would have something similar. With regard to Maggie, interestingly, the German word for fabric is "Stoff." The chinoiserie aspect is charming because it is understated. I am reminded of Van Day Truex's statement to a Parson's student who was using Chinese decoration, "Be careful or it will end up looking like a chop suey palace." Lanky Pauline likely found a bolt of it at some antiquarian, and it would be difficult to trace. I think it might be from the 20s because 19th century Chinese themes were so much more emphatic than this. It looks more modern, between Edwardian and Art Deco. 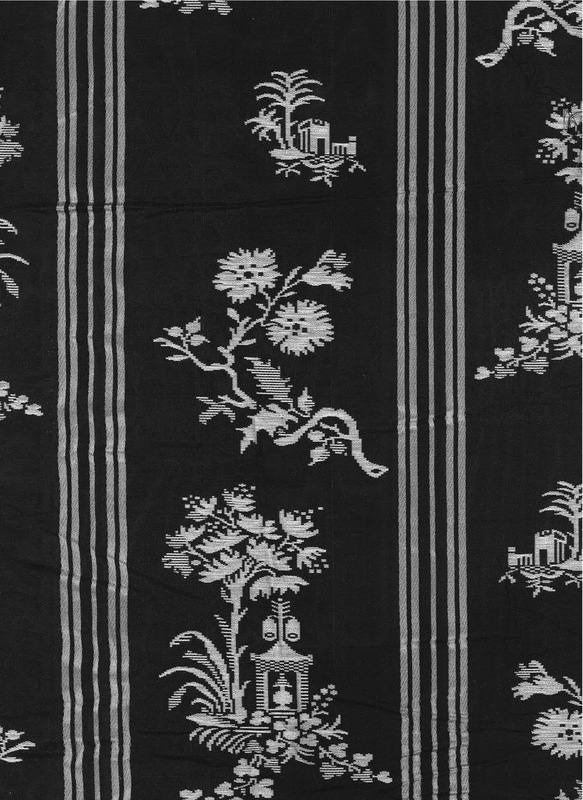 Those are very common Chinoiserie motifs. You see them in a lot of fabrics. 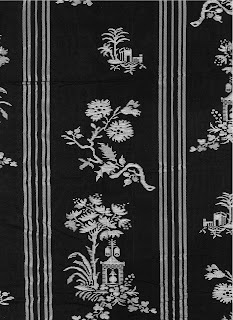 For fabric, I think Scalamandre might have something similar from not so long ago. 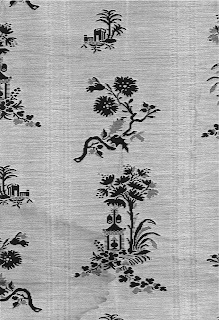 For wallpaper in a similar style, you might look at some of the Williamsburg reproductions. I have actually seen this. Now I will have to rack my memory...where and when. If only I could develop the film in my head! Then I could label it! I am working on retrieving it! Love calling it "stuff"!!! Terribly "U"!! I think PM was just being particularly difficult, and showing the trait for niggling each other that they were both good at. What do non-Us call it? Don't tell me, "stuff"?! There is a Wizard of Oz of Fabrics - Keith McCoy & Associates on Melrose Avenue. He has been involved with Vintage Textiles for decades as well as a vendor of some of the most exclusive fabrics in the World of Textile...even helpful to Museum collectors. Interesting, I love the search for a mystery fabric or anything antique for that matter! Good luck, I am unfortunately of no help! But I agree with Farmschool's comment the word stuff might really stem from the German Stoff! Meaning fabric! First of all, heartfelt congratulations to this blog - I found it by accident and was right away feeling at home. Wonderful!!! 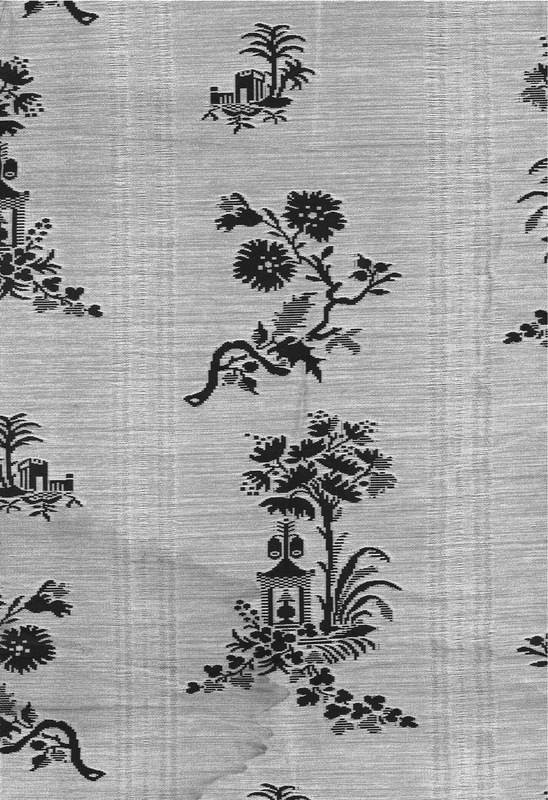 It is an old fabric from La Manach which is available through Claremont ( It was sold at Brunschwig before most of you were born) I have only seen it in red/taupe and blue/taupe colorways. Unfortunately, an executive at Georges Le Manach has told me, quite clearly, that the fabric is not one of the company's products.